As the owner of a newly plastered pool, you may have some questions about the care required to properly maintain the new surface. The following suggestions and pointers will help inform you about special areas of concern. Please remember that these are "generic" tips – for specific instructions it is always best to consult your builder, plasterer or service professional. The hose is placed at the bottom of the pool with a clean soft cloth wrapped around the end to diffuse the water entering the pool. The water must be left running until the pool is full and the water level is halfway up the skimmer opening. If more than one hose is used, additional hoses should be placed on the deck and weighted down so that the water will project into the deep end of the pool. Additional hoses should only be turned on once the pool contains 3 to 4 feet of water, with the volume adjusted so that the water does not contact plaster, only the center of the water in the deep end of the pool. Use care that water is not introduced in a manner that can damage plaster. Do not use the fill line to fill the pool. Do not fill the pool using softened water. There are several approaches to initial start-up. The main objectives are to balance pH, total alkalinity and hardness levels, and to remove the plaster scale (dust) created by fresh plaster and water. Questions regarding start-up should be directed to the builder, plasterer, or service technician. The start-up procedure plays a critical role in the cosmetic appearance of the plaster surface in the years to come. Consult your builder, plasterer or service company regarding special brushing needs during the first month of new plaster. A basic set or equipment for the pool owner includes an extendable pole, nylon brush, skimmer net, vacuum hose, brush-style vacuum head, and a 4-way test kit. A roller-vacuum head may be used after the first month. 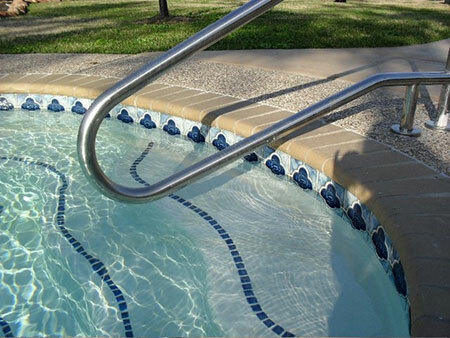 Your pool care will change depending upon the season of the year. You will find that during the summer season, your chemical usage will increase due to evaporation, greater sunlight, increase in water temperature and pool usage. During periods of high winds, your plaster may need to be brushed more frequently to prevent dirt from adhering to the surface. In the rainy season, you may need to lower the water in your pool to maintain the proper level (halfway up the skimmer opening.) Do not allow pool to overflow. The surface of your pool is constantly changing, 24 hours a day, 7 days a week. Many factors contribute to these changes, including the water hardness, heat, evaporation, treatment, maintenance, usage, and the composition and curing characteristics of the plaster itself. In time, the cosmetic appearance of the plaster will gradually change as a result of these naturally occurring factors. There are some procedures that can be helpful in minimizing these effects. Please consider the following section on preventative maintenance for better plaster care.